Din Sized enclosure for panel mounting. Digital dual display for set value and process value. FUNCTION (programmable): ON DELAY / INTERVAL /CYCLIC ADJUSTABLE. TYPE OF START SIGNAL (programmable) : NO START / PULSE / CONTINUOUS. One of the relay c/o can be configured as INSTANT or DELAYED. Program lock is provided for function, relay configuration, type of start signal and range selected. HOLD/RESTART facility during power failure conditions. Features & Specifications :Preset timer, Push wheel settingDigital Timer, high accuracy, push wh.. Features :Din Sized enclosure for panel mounting. 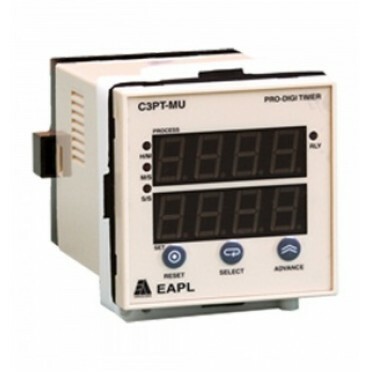 Digital dual display for set value and process val..